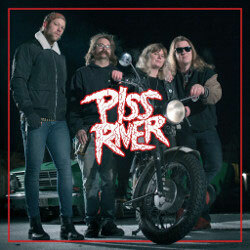 Piss River releases their debut single and video to the song Bad Reputation. The song is the last track on their upcoming self titled debut album. Combining the best parts of Girlschool, L7, The Gits and Annihilation Time will take you quite close to Piss Rivers. The album have the same kind of clash of musical influences as the alternative rock and pre-grunge era held in the late 80´s and early 90´s. Punk attitude that makes NWOBHM riffs even more intense combined with passionate self empowering lyrics that throws punches everywhere. You can hear the shivers from the underground on Piss Rivers debut album that is released the 27 of April on The Sign Records. Members of Piss River have a background in bands as Auktion, Skitkids and Warchild. Everything is recorded by Erik Lindbergh of Misantropic in Ljudkross Studio in Umeå, Sweden. The album is released by The Sign Records that have during the last year given us memorable rock releases as Honeymoon Disease, Grande Royale, Hällas, Highrider, Demon Head and Night.